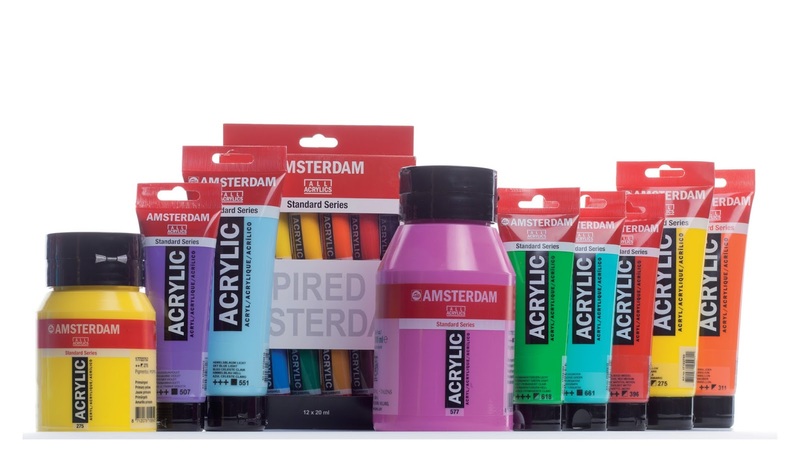 Earlier in the year I had the pleasure to review several brand new and cutting edge acrylic products created by leading art brand supplier - Royal Talens. The review was published in the October issue of 'The Artist' magazine. Recently I took the brand new 'Amsterdam Acrylics' Standard and Expert Series of highly saturated paints (with great lightfastness) to Rydal Hall on a residential art week I led in late October. It was an absolute delight to share my creative discoveries using these amazingly versatile paints during our great art week together. Royal Talens professional Amsterdam Acrylic tube and spray paints are really great to use - so versatile and easy to use. Addictive even! Several exciting and well received demonstrations I gave throughout our great art week together helped create paintings once again I'm personally delighted with. I have to say, using Royal Talens acrylic spray paints in particular has been a real game changer for me offering new and exciting directions with my own work - less and less I'm using a brush to paint with thanks to Royal Talens spray paints! Placing the work flat on the floor allows a flat even spray with Royal Talens Amsterdam acrylic spray paints to be achieved. Here I am mid way through my demonstration showing how Royal Talens Amsterdam acrylic spray paints work brilliantly in a mixed media context to build up visually eye catching coloured layers for another expressive painting of The lake District. Masking and spraying for further layers continues. The torn and cut edges with of thin paper (old envelopes turned inside out) worked perfectly to give further lost and found edges in multiple layers throughout the painting process. Such great and inspirational paints to use for all sorts of creative directions. Having a wide range of nozzles from supper fine to broad spray allowed even more creativity. I love the way these opaque spray paints work over transparent water media (Royal Talens Van Gogh watercolour paints and Royal Talens Gouache) to build lots of wonderful expressive marks. Using all these top quality products sure inspires confidence as I work in any given situation...to include my demonstrations as well. Here's how the painting looked at the end of the evenings demonstration at Rydal Hall. For final details I could return to drawing again (having initially started using 'starter set' Royal Talens acrylic markers to freely draw the painting out with rich and permanent colours), by using Royal Talens Rembrandt pastels or paint again with perhaps some Royal Talens Ecoline acrylic inks. Now you know why I love all their professional products so much - creativity has never been so good thanks to Royal Talens! Derwent Inktense does it again!